It also provides a footnote in the Harvey Mitchell family story. Somewhere I'd come across a mention that two of Mitchell's relatives had fought at Guilford Courthouse on March 15, 1781, and that Harvey Mitchell's uncle William Harvey had died there. 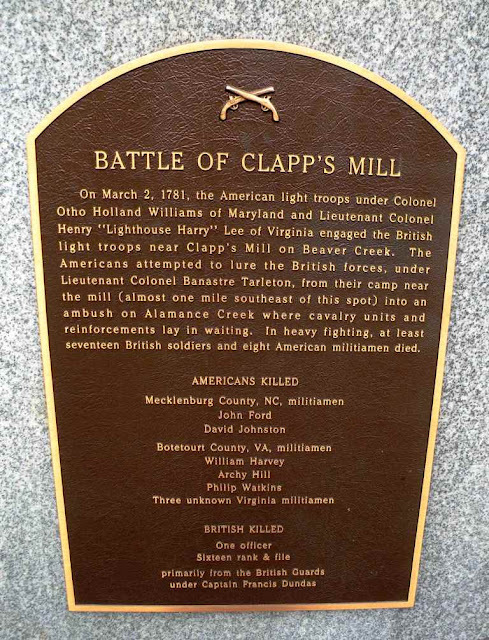 Here on this marker (above) we see that, in fact, William Harvey of the Botetourt County Virginia militia was killed at Clapp's Mill on March 2, 1781, about two weeks before Guilford but during the same campaign.